Theagamh gun tàinig Gàidheil gu cladaichean Siorramachd Inbhir Nis na bu tràithe na àite sam bith eile ann an Ceap Breatuinn. Ràinig a’ cheud luchd-àiteachaidh à fearainn Chloinn Raghnaill – Mùideart, Mòrar, Uibhist is na h-Eileanan Beaga. As an deoghaidh sin, thàinig 's thuinich daoine à Strath Ghlais, Loch Abar is feadhainn a bharrachd à Uibhist a Deas – `nam measg, Gàidheil a dh’ àitich an toiseach an Eilean Eòin. Dh’ fhalbh a’ chuid a bu mhotha dhe na daoine seo ann an dùil gu faigheadh iad cuidhteas a' fòirneart `s na h-àiteachean a chuir iad ri `n cùl. Gu dearbha, tràth `s an naoidheamh linn deug, cha bu mhór nach deach muinntir Eilein Ruma gu lèir a dh' fhuadachadh anull gu tìr aig Caolas Chanso. Buinidh Gàidheil Shiorramachd Inbhir Nis do dhà eaglais: an Eaglais Phròstanach is an Eaglais Ròimh. Chìthear an diugh mar a chruthaich na Gàidheil coimhearsnachdan 's a bheil cleachdaidhean is cànain ionadail mar a bh' aig an cuideachd air an thaobh thall dhe 'n chuain. 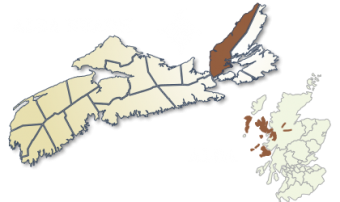 Inverness County, in the 1790s, may have been the area of Cape Breton earliest to receive Gaelic-speaking settlers. The following century saw settlement of ‘The County’ by Gaels from the Braes of Lochaber, Strathglass, the Uists, Moidart, Morar and the Inner Hebrides, many had previously been on Prince Edward Island. Gaels of Inverness County adhere to Catholic or Protestant churches. As in other districts, families from the same geographical region, or faith, formed distinct communities, as evidenced by local dialects and folklore.